In the previous post I thoroughly described how to fuzz Apache's httpd server with American Fuzzy Lop. After writing that post and, to my surprise, got a few crashing test cases. I say "to my surprise" because anybody who managed to get some good test cases could have done it before me and, despite of it, I was the first in reporting such vulnerability. So here's the blog of it! 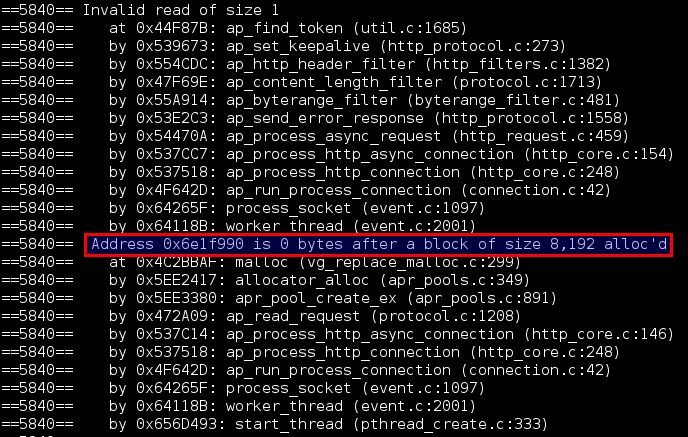 After seeing Apache httpd server crashing under AFL, lots of problems arise such as, the crashing tests doesn't crash outside of the fuzzer, the stability of the fuzzed program goes way down, etc. In this blog post we will try to give an explanation to such happenings while showing how to get the bug and, finally, we will shed some light on the crash itself. Since this was just a testing case for myself to fuzz network based programs with AFL, I did not bother too much on getting complex or test cases that had a lot of coverage. So, in order to get a few test cases that would cover a fair amount of a vanilla installation of Apache's httpd server, I decided to look up an easy way to scrape all the headers from the List of headers - WIki Page. Bash-fu Tao 2: Chain punching with "for"
Let me explain such an abomination quickly. There is a thing called the Internal Field Separator (IFS) which is an environment variable holding the tokens that delimit fields in bash. The IFS by default in bash considers the space, the tab and the newline. Those separators will interfere with headers when encountering spaces because the for command in bash iterates over a given list of fileds (fields are separated by the IFS) - this is why we need to set the IFS to just the newline. Now we are ready to just iterate and echo each header to a different file (the a variable helps to dump each header to a file with a different name). It is worth mentioning that I cheated for this demo a bit as I introduced already a test case I knew it would make it crash "soon". How I obtained the crashing testcase was through a combination of honggfuzz, radamsa and AFL while checking the stability + "variable behaviour" folder of AFL. Euh... it doesn't crash outside Apache. What could be happening? This means that maybe our test case did make the program crash but that it was one of many. In our case the __AFL_LOOP variable was set to over 9000 (a bit too much to be honest). For those that don't know what said variable is for, it is the number of fuzzing iterations that AFL will run before restarting the whole process. So, in the end, the crashing test case AFL discovered, would need to be launched in a worst case scenario, as follows: Launch all other non-crashing 8999 inputs and then launch the crashing one (i.e. the last test case) number 9000. The stability keeps going lower and lower. Usually (if you have read the readme from AFL you can skip this part) low stability could be to either, use of random values (or use of date functions, hint hint) in your code or usage of uninitialised memory. This is key to our bug. In this case the memory is unlimited as we are running afl with "-m none" but in other cases it can be an indicator of overflows (stack or heap based) and access to unallocated memory. To test against our first assumption we need more crashing cases. To do so we just need to run AFL with our "crashing" test case only. It will take no time to find new paths/crashes which will help us narrow down our over 9000 inputs to a much lower value. Valgrind is composed by a set of instrumentation tools to do dynamic analysis of your programs. By default, it is set to run "memcheck", a tool to inspect memory management. 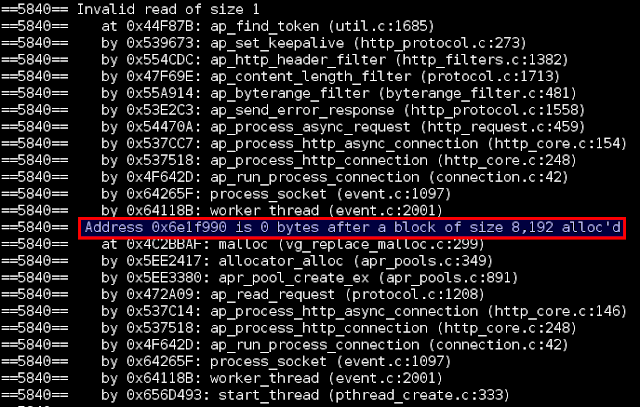 We can confirm that, yes, Apache httpd is making use of uninitialised values but, still... I wasn't happy that Apache won't crash so let's use our Bash-fu Tao 2 to iterate over each test case and launch it against Apache. Good good, it's crashing now! We can now proceed to do some basic triage. One cool feature about valgrind is that, it will let you analyse the state of the of the program when an error occurs. We can do this through the --vgdb-error=1 flag. 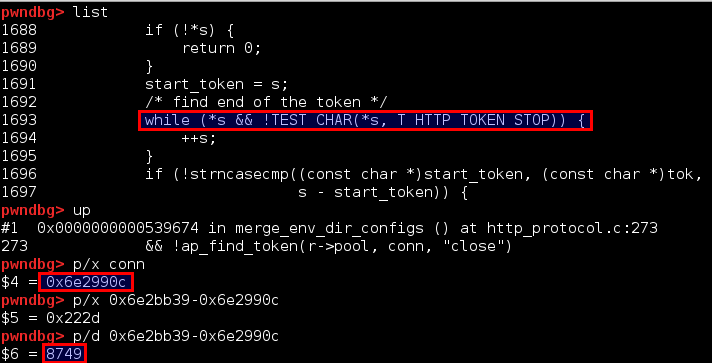 This flag will tell valgrind to stop execution on the first error reported and will wait for a debugger to attach to it. This is perfect for our case since it seems that we are accessing uninitialised values and accessing values outside of a buffer (out-of-bounds read) which is not a segfault but it still is an error under valgrind. Figure 1 - Inspecting on first valgrind reported error. As you can see the first reported error is on line 1693. Our intuition tells us it is going to be the variable s as it is being increased without any "proper" checks, apart from the *s instruction, which will be true unless it points to a null value. Since s is optimised out at compile time, we need to dive into the backtrace by going up one level and inspecting the conn variable which is the one that s will point to. It is left as an exercise for the reader as to why the backtrace shown by pwndbg is different than the one shown by the "bt" command. For the next figures, keep in mind the 2 highlighted values on Figure 1: 0x6e2990c and 8749. Here is where, for our analysis, the number from Figure 1, 8749, makes sense as we can see that the variable conn is allocated with 8192 bytes at 0x6e2990c. We can tell that something is wrong as 8749 is way far from the allocated 8192 bytes. During the process of the triage, one can find several happenings that can hinder the debugging process: Apache will stop out of nowhere (haven't managed to get the reason why), valgrind will make it crash on parts that it is not supposed to because of it adding its own function wrappers, the heap will be different on valgrind debugging sessions than plain gdb or vanilla runs, etc. Here is where the Record & Replay Framework comes in handy: Deterministic replaying of the program's state. You can even Replay the execution backwards which, in our case, is totally awesome! Must say I discovered this tool thanks to a good friend and colleague of mine, Symeon Paraschoudis, who introduced this marvellous piece of software to me. Full analysis is not provided as it is outside of the scope of this post. We have learned how to use bash to effectively scrape stuff as test cases from the web and to believe that, even thought hundreds of people might be fuzzing a certain piece of software, we can still add our value when using the right combination of tools, mutations and knowledge. Tools have been discovered along the way that will aid and help further triage. Stay tuned for the search of animal 0day! Cross-posts from the SensePost blog upcoming with challenges on heap-exploitation! I am willing to donate the 1500$ bounty I received from the Internet Bug Bounty to any organisation related to kids schooling and, especially, those teaching and providing means regarding Information Technologies. Knowledge is Power! So tune in and leave your suggestions in the comment section below; I have thought of ComputerAid, any opinions on this?